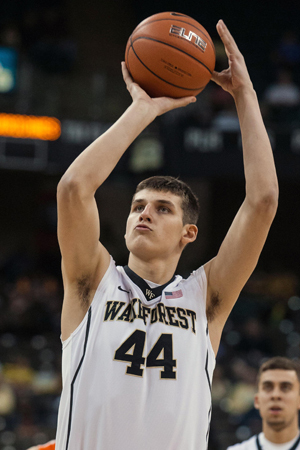 Jacob breaks down Dinos Mitoglou, a 6-10 sophomore forward for the Wake Forest Demon Deacons. Wake Forest’s Konstantinos “Dinos” Mitoglou was something of a mystery before landing in Winston Salem last fall. Originally from Thessaloniki, Greece, Mitoglou actually played scrap minutes in three professional games for the Greek team Aris of the GBL before deciding to move stateside to play for Wake Forest in 2014. As a freshman, Mitoglou quickly became a focal point in the Demon Deacon’s offense, leading the team with 52 three-pointers and averaging 17.3 points and 8.2 rebounds per-40 minutes. He followed up his impressive freshman season with a busy summer, in which he helped lead Greece to the semi-finals of the FIBA U-19 World Championships. Mitoglou has the size and skills of a traditional European big man. At 6’10 and 245 pounds, he doesn’t overwhelm opponents with his size but relies on finesse moves to gain open looks. He’s not particularly long and his slow first step, mixed with unrefined lateral footwork, will limit his potential as a defender. Still, like most well-coached European players, Mitoglou has a nice understanding of where to position his body defensively and rarely leaves himself susceptible to a mismatch. Offensively, Mitoglou is already one of the best floor-spacing big men in the NCAA and possesses a release that is both impressively quick and unconventionally high. When given time to spot up, Mitoglou’s release point comes with his hands directly above his head, making it virtually impossible for defender’s to block. Early on as a freshman, Mitoglou struggled mightily with confidence: through Wake’s first seven games, he made just two of his first 15 three-point attempts. Once he got comfortable in Danny Manning’s offense, however, Mitoglou showed his potential as a sharpshooter. In the 26 games he played after his cold start, Mitoglou was one of the best perimeter shooters – regardless of position – in the nation. He finished the year hitting on 50 of his last 120 perimeter shots (41.7%), including a torrid five-game stretch in January and February where he made 21-of-36 (58.3%) three-point attempts against quality ACC opponents. While Mitoglou has the body and ability to set up comfortably around the basket, he showed a strong preference to camp out on the perimeter as a freshman. Per Synergy Sports Technology, 66.7% of Mitoglou’s offensive possessions in the half court came via the jump shot. When he did try to use his size to bang down low, Mitoglou looked like a savvy interior threat. He made 28 of his 50 shots around the basket in the half court (non-post up), using his lower body strength proficiently to seal off defenders from entry passes and gain clean angles at the hoop. Mitoglou missed quite a few “gimme shots” around the rim, largely due to his impatience to get the release off, but should improve his finishing organically as he gains more experience. He shows dexterity with both hands and looks impressively comfortable posting up on either side in the paint, though the sample size is admittedly small. Mitoglou’s quick and high release means his shot’s outcome is rarely influenced by the defense. According to Synergy, Mitoglou shot 34-for-85 (40%) on catch-and-shoot attempts when he was guarded last season. When he was left unguarded, Mitoglou’s efficiency actually decreased – converting on just 14-of-40 (35%) of uncontested shots. He was reluctant to put the ball on the ground as a freshman, though he didn’t look totally out of sorts when he was forced to handle in limited spurts. He was somewhat careless at times, sporting a high 15.6% turnover rate, but that number should improve as he gains experience. Off the dribble near the paint, Mitoglou uses a wide spin move that’s effective in creating space from the defender while bringing him closer to the basket for an easy look. One of the biggest knocks on Mitoglou is that he’s a vacuum with the ball. Mitoglou averaged just 0.7 assists per-40 minutes as a freshman – one of the lowest rates for any prospect in the DX database. Moreover, he averaged a 0.05 assists per possession last year, ranking him among the worst five freshmen in college last season at distributing. Defensively, Mitoglou is below average but not for a lack of effort. He has a delayed reaction time to opponents’ first steps, which will only get more problematic as the talent levels and game speed increase. While he has lower body strength, he could use some work in the gym to improve his upper body. In the post and around the basket last season, opponents shot 33-for-65 (50.7%) against him. Mitoglou’s lack of length limits his rim protection, as evidenced by an unremarkable 1.1 blocks per-40 minute rate. Overall, Mitoglou will need to show improvements as a finisher around the hoop and as a facilitator in the offense. He has underwhelming speed for the ACC at the moment so working on his conditioning and quickness will be absolutely essential for him to succeed at the next level. Scouts will certainly appreciate his combination of size and shooting but, at the moment, there are too many weaknesses in his game that need correcting. Still, with Wake Forest returning many of its core players from a season ago, expect Mitoglou’s profile to rise as the team improves.